Martin Popoff has written the third in his Backbeat Books series of day-by-day books; following earlier subject matters Iron Maiden and Ozzy Osbourne, this one is about Mӧtley Crüe. 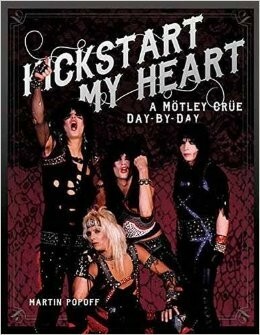 The format is simple; a chronology of the band starting from the births of the band members (Mick Mars is the oldest by over seven years), lots of quotes from the band members and most importantly lots of photos. The photos are of the band members themselves but also include flyers, ticket stubs and backstage passes – so this book is a real collectable. Popoff is at pains to say in the introduction that although not whitewashing the "dirt" side of the band, this book is really about the music. So the various "non-music" episodes of the band are told in a more matter-of-fact style than in other tomes about the band. As always, Popoff's book is very informative; I learnt the misspelling of the band name is a homage to Slade and that WWF/E star The Undertaker is a fan of the Crüe. Also, Mars's AS (Ankylosing Spondylitis) condition is covered; described by Mars as an inconvenience – he can still play the guitar but cannot drive as he is now unable to move his neck around for example. 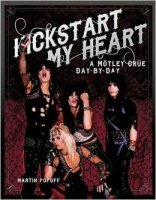 This style of book makes for an easy read that you can dip in and out of; Popoff's essay on each decade of the Mӧtley Crüe's thirty-five year career contains his views on the music highs and lows. This is not just a fan's over-enthusiastic view of a band but more a discerning professional view on an influential but slightly inconsistent band.